We left Thurs after lunch in a UNICEF truck and arrived in Llallagua, a slightly larger town just down the road from Uncia. As you may know from my last post, there have been some social disturbances lately (which seem to have calmed down now) and I was a little worried that we may not be able to go. However, we were able to leave without any problems. On the highway between La Paz and Oruro, there was a roadblock (for what cause or purpose we don’t know) but we were able to drive through a nearby community and avoid waiting in a line of trucks for the roadblock to be taken down. Upon arrival in Llallagua, we rented rooms in the nice hotel (which means it was both relatively expensive and fairly clean) and went to bed. We were in Uncia to visit 5 communities who have had success in a pilot project UNICEF started about a year ago. It is basically a new method to introduce sanitation facilities to a community, and is called Santolic (saneamiento total liderado por la comunidad … or in English – community-led total sanitation). It is a process by which the community becomes aware of their own living situation and how it can cause illnesses. For example, the facilitator will bring a model of a fly to the community, pass it over some poo and then touch it to a glass of water. Or, the facilitator will go over calculations of how much excreta a community produces in a year so that they become aware. Then the community decides what they are going to do about it. In these 5 communities, all the families have built their own latrines using their own local materials and without any help from an outside organization (UNICEF is providing the training, but that’s it). In many of these communities, the men all leave to work in the mines, or in the chapari, or in Argentina, and the women are left to take care of the families. So in a lot of cases, it was the women alone (of all ages) who built the latrines. Friday morning started bright and early. 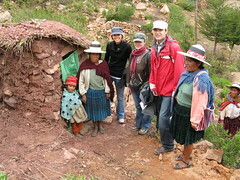 We left Llallagua at 6am to head to the first community, which was called Pata Pata. It was about 2 hours away and the community was ready and waiting when we got there. The first order of business was to see the latrines. And did we ever! We walked around the community and saw every latrine that was built (somewhere between 25 and 30) and talked to the latrine owners about why and how they built them. That took about two hours! Then it was back to the school to have a meeting with the community members, where we gave them words of encouragement and congratulated them on being an open-defecation free community. I was there representing UNICEF and so gave a little speech. Mostly, I underlined the fact that the community is one of the first in South America (the process has been widely used and widely successful in Asia…but never in S.America) and that the world was watching to see what the results would be. The end of the process is not the construction of latrines, but the change of habits. Therefore these communities, although they have been successful this far by having all the members build latrines (if the entire community does not get involved, there will still be open defecation and therefore contamination by various vectors in the community), they have not yet demonstrated that they will continue to use the latrines on a long-term basis. So UNICEF will be back to visit the communities in another four months or so to see if they really are using the latrines. 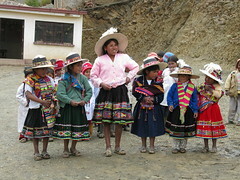 After the speeches by us, the community leaders and people from the municipal government, there was music and dancing. We all participated…and the dancing seemed to go on forever! We were then given food – a typical dish called Chanca (although I could have that totally wrong) which consists of meat, potato, chuno, corn, and lima beans. It was a bit if-fy, so I only ate some of the potatoes and the lima beans (in one community there was definitely some sort of meat with fur on it). But it is nearly impossible to say no to the food they are giving you because they prepared it especially because you are coming for a visit. The juice they were serving out of an open bucket I did say no to … that was just way too risky! We were finally able to make an exit sometime after noon in order to make our way to the next community. This was basically the formula at each community, only after the first one we got smart and divided ourselves into three groups to tour the latrines, which meant we didn’t have to see 30, but somewhere around 10 each. It saved a lot of time! Luckily the two other Canadians (Julia and Andrew) were there to be the token white faces in the other groups, otherwise I would have been visiting latrines ‘til the cows came home! In 3 of the communities there was music and dancing and in all of them there was food – the same typical dish with slight variations…minus or plus one ingredient or other (not to mention the bits of meat that looked like they still had fur on them….). On Friday and Saturday we visited two communities per day and finished up Sun morning in the 5th before heading back to La Paz. I was quite impressed with the results we had seen in the communities. 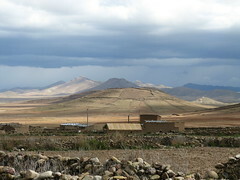 Everyone in these places, which are some of the poorest communities in Bolivia realized the benefits of sanitation and did something about it themselves, as a community. We have also had some communities where the process hasn’t worked – often where there are other NGOs present and the community is used to receiving things. We also saw a bit of the town of Llallagua. There isn’t much to see! And it is probably the first place I’ve been in Bolivia where I have felt people looking at me. They are not used to tourists, that is for sure! The first night we had a lot of difficulty finding something to eat – there were a tonne of fried chicken eateries, and that was about it! After a day in the field we were starving and couldn’t wait for the cook to appear at the hotel at 8pm, so opted for the chicken! It was actually pretty good. Saturday we arrived back in town at about 6pm and went out for Charquekan with everyone in the group. Charquekan is a dish consisting of dried llama meat that has been fried, along with hard-boiled eggs, corn and potatoes. It was also pretty good (but also may have been because we were starving!). After dinner we headed to one of the only forms of entertainment in a lot of little towns in Bolivia – Karaoke! Karaoke in Bolivia does not involve a stage. You sit with your group on some pretty dirty sofas and they bring the mic to you. There are TVs around the room so you can read the words. It was pretty fun! So now I am back in La Paz for less than 3 weeks and the time is flying. I have two weekends left, which seems crazy! Submitted by Jenn (not verified) on Fri, 2007-12-07 09:28. Even though I've been so excited to read about all your adventures, I'm selfishly glad that you're coming home soon! It's great to see that progress is being made in the villages you visited though, and we'll hope for the best that they will continue using those latrines!! Darren, Catriona and I can't wait too see you when you come to visit!! Submitted by TheAdmin on Thu, 2007-12-06 17:58. Wow, after looking at your photos it shows you saw a number of latrines... different shapes, sizes and techniques. I was surprised at how many were small. Was there not some neighbour-to-neighbour collaboration? I mean, was the lady with the two foot high latrine not liked in the village? Submitted by Meg on Fri, 2007-12-07 10:20. There was certainly some collaboration, but generally within the family. So, an old woman's kids would help her build the latrines. But there were also several women who did not have any help, for reasons that I don't know. The owners of the short latrines usually say they are going to make it taller later, but because the rainy season is started they had wanted to put a roof on it now.